In my last blog (…gosh, two months ago…where does the time go?? ?…), we shared our misadventure in trying to develop a blue version of our tortoise shell drop pot bowl which was purchased by a couple from Oklahoma. 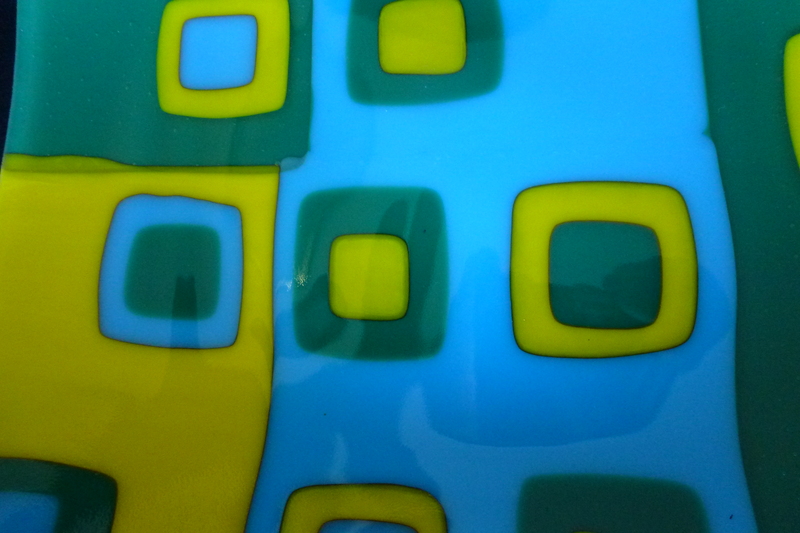 I say “misadventure” because even though we put white and blue glass together, the result was essentially black! This was totally unexpected. 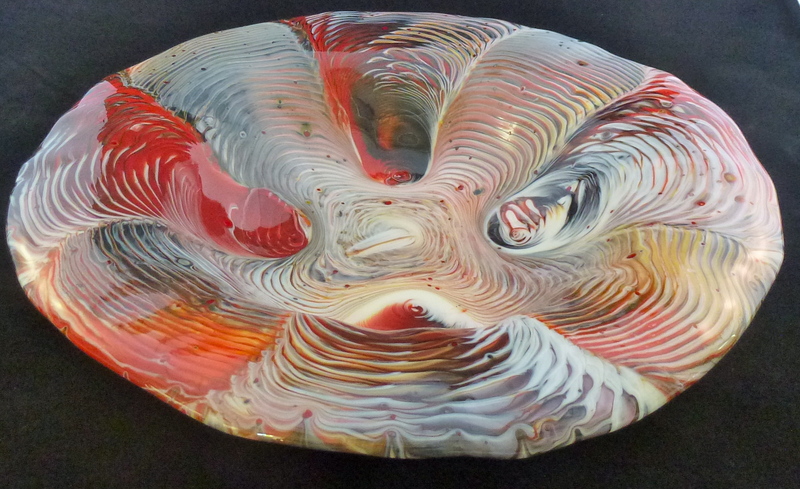 Fortunately, the bowl itself was quite beautiful in spite of not being the blue we had envisioned. 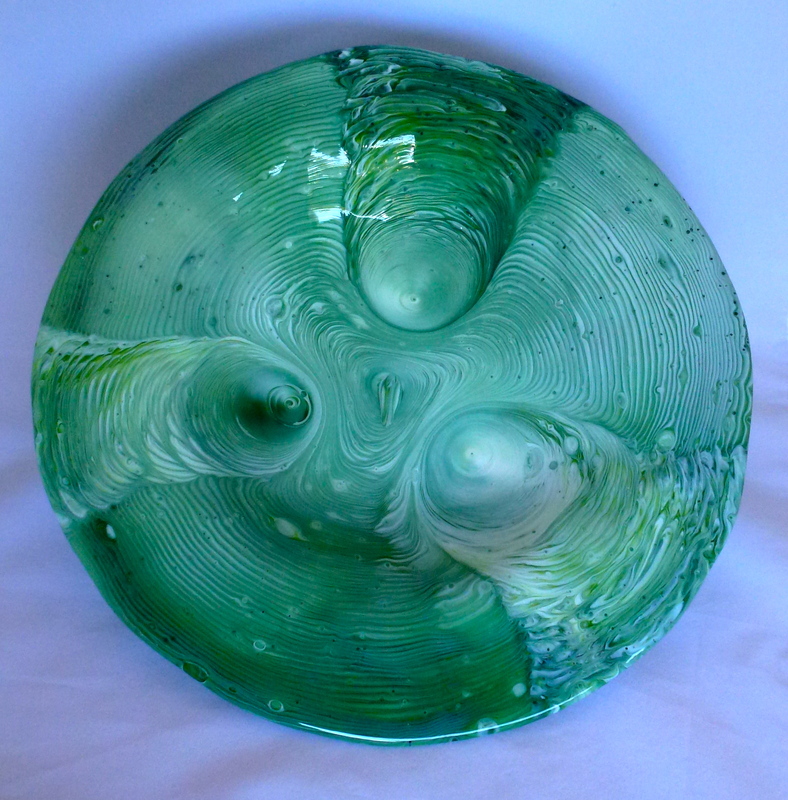 It has been admired by many who have seen it displayed at our Marriott glass showings on Mondays… and in fact, purchased by a Maui visitor just last week. (Sorry…I failed to get her name, but Mahalo whoever you are!!) Anyway, as the title indicates, we have “solved the mystery”… and by “solved” I mean not only did we come to understand the issue, but also found a way around it. What I first thought of as being a miracle,… or maybe black magic…, was really a lesson in Chemistry 101. It turns out that the white we used (…actually an off-white…) had a sulfur based compound in it, and the blues had copper based compounds. When melted into a slurry as happens with drop pots, the copper and the sulfur “reacted” to create black. The way we learned this was from a technical chart provided by Bullseye (our glass supplier) which clearly spells out which glass colors are sulfur based and which are copper based. (Truth is, I failed to read the technical report… but maybe that’s a good sign in that I’m indeed transitioning from left brain to right brain…yeah, that’s a positive way to look at it!!) Since most of the blue glass is copper based, we just needed to find an off-white that wasn’t sulfur based. With Bullseye’s chart in hand, we did,… and voila, as seen in the first photo, we were able to achieve the blue tortoise shell pattern we were looking for. Then, feeling very confident with our new found knowledge, we successfully created a green version of the tortoise shell as shown in the second photo. We are definitely on top of this and don’t have to pray to the Glass God any more… at least for creating the tortoise or sea shell motif. There’s more… because I haven’t totally disconnected from my left brain thinking. There were other curious and unexplained observed phenomena in the past that I now realize was a result of the same effect. One that occurred a couple of years ago that we noticed was that certain glass colors seemed to magically develop a black outline of the cut glass…but not always!! That was confusing. We had no idea why or when, but thought it was curiously “neat” when it did occur. 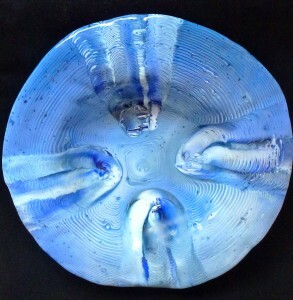 The third photo shows a section of a small bowl made with pieces of green, blue, and yellow glass. 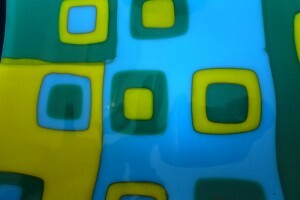 The blue and the green pieces that adjoin do not develop a line, however if either is next to yellow glass, the line appears. Now we understand… the green and the blue glass have copper and the yellow has sulfur. The fourth photo shows a red version of the tortoise shell that was done before we learned about the copper-sulfur reaction. We used several different reds along with the off white glass. The result was a striking piece that now actually resides with Becky in Indianapolis, IN. As seen in the photo, the piece has some black in it… purely serendipitous. At the time, we didn’t understand where it came from. Now we know. We lucked out because we must have included a small amount of a copper based red, enough to infuse some black lines, but not enough to dominate the piece in black…mysteries solved!! We can sleep now. OMG!! She’s Going to Kill Me!